Visually, Yaiba: Ninja Gaiden Z is a cel-shaded treat in the same vein as last year's Killer Is Dead and even the lesser quality graphics and textures feel planned. As I spent my time with Yaiba, I kept thinking that if this was a movie, it would be a grindhouse B-rated anime film full of tongue-in-cheek jokes and gore galore. From the conversations Yaiba and Miss Monday (if you're feeling naughty) have, to obtaining weapons from killer zombie clowns called "Nun-Chuckles", this game offers laughs and a good time if you have the right mindset. I definitely put this title in the "must like this type of vibe" category because it is so. Having played most Ninja Gaiden games including some of the more retro titles, Yaiba feels more like the black sheep of the family. This game is officially a spin-off to the main series but it feels nothing like the series at all. From my experience, most spin-offs do, in someway, feel like the game from which it branched off from. As I slice and dice zombies, I constantly have to remind myself of what exactly I'm playing. Let me state again that Yaiba: Ninja Gaiden Z does not feel like it's part of the Ninja Gaiden franchise at all. Besides sharing the same name and having Ryu Hayabusa in it, I would be convinced Grasshopper Manufacture (responsible for notable Suda 51 titles) developed Yaiba and not Team Ninja. Alas, Team Ninja is one of the studios responsible for the creation of this game but the more I play, the more I think Goichi Suda was the true mastermind here. 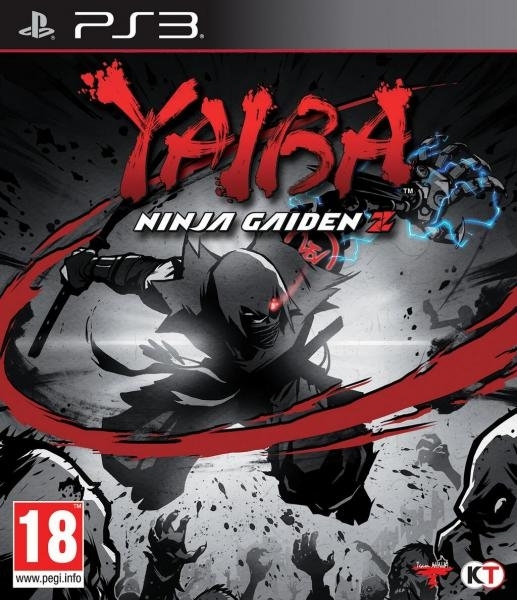 If Mondo Zappa from Killer Is Dead and Juliet Starling from Lollipop Chainsaw had a baby, it would be Yaiba: Ninja Gaiden Z. Along with some technical issues, I believe this confusion as to what the game was supposed to be, is the true culprit for the abysmal review scores. Are they wrong? Not at all because everyone is entitled to their opinion. While I was expecting a more Ninja Gaiden experience, what I got instead was a fun but sometimes annoying mindless zombie massacring experience with issues that hinder said experience. Speaking of, the gameplay is about as single-minded as Yaiba himself. By all rights, Yaiba is a purebred hack and slash title. Using his trusty (and broken) Heartless Blade, the newly acquired cybernetic arm and a devastating Flail, Yaiba is armed to the teeth. Good thing too seeing as Yaiba can't use Nippo, the magic attacks most skilled ninjas can pull off. Instead, players must rely on quick reflexes, timed blocks and the murderous intent Yaiba houses in his very being. To most effectively handle the undead hordes, identifying the type of enemy helps in a big way. For example, the brute zombies are more vulnerable to the heavy attacks of Yaiba's cybernetic arm. From here, it's only a matter of combining all three weapons in a flash of flurry combos. During combat, enemies will enter a weakened state if attacked harshly. At this point, Yaiba can brutally execute the foe and gain some health in the process. Up to 10 executions can be pulled off in a row; granted enough enemies are put into the weakened state. Each execution is as vicious as the last and even though I've seen about all of them, I still sometimes get a wicked sense of pleasure when pulling it off. Yaiba can also grab weak enemies and use them as weapons. This includes swinging them around like rag dolls or tossing foes at each other. I found this tactic to be almost completely useless because by the time I weaken most enemies, I usually just executed them. However, It could be used to add some variety to the way I finished off enemies, so I suppose that's a plus. Blocking and counter measures are also available and while blocking helps to stave off most damage, unless of course I'm really bad at it, I could not counter enemy attacks for the life of me. Every once in awhile, my luck would pay off but more than anything, I would pay the price for even trying. I feel like countering was especially difficult for me because the mechanic felt beyond clunky. As Yaiba attacks his many enemies, a meter begins to build called Bloodlust. Replacing the now usual "Ultimate Technique", Bloodlust allows Yaiba to tap into the murderous intent of the Kamikaze Clan and decimate multiple enemies in rapid succession. This can be done without having to worry about taking damage as Yaiba is invulnerable for a limited time. Bloodlust mode is very useful for talking out lots of enemies and can even save a trip back to the load screen by not dying. The core gameplay is very simple and can even be repetitive most of the time. It does tends to get boring going through the same hordes of enemies on repeat and dispatching them in the limited ways. While I like the executions, I've seen all of them so the allure of each has begun to wane. Though it's not like I have long to really invest here. Yaiba is a really short title, bordering on 3-4 hours to beat. Currently, I have 2 hours under my belt with 3 more levels to go and had I not died so much, I could easily see myself standing with only an hour under my belt. Which brings me to replay value but as far as I'm concerned, there isn't any. Unless you're a masochist, once Yaiba has been beaten, I can't think of any good reason to delve back in until a few months for a break. Players can try to break high scores or even challenge the harder difficulties but there's a major flaw, which will hinder most from even trying. The camera. Probably one of the worst camera issues I've had to deal with since games from the 90s but at least those had a reason. Fixed camera angles should be no more and yet, Yaiba has a camera with a life goal of making the player's life miserable. I've always stood behind the belief that a hack and slash game should have a camera able to keep up with the action. This title proves how right I am. Since the combat is fast paced and frantic, the camera is super important... well it's supposed to be. I spent more time trying to figure out where Yaiba was on the battlefield than I should have. There have been plenty of times where I got sucker punched by an enemy I couldn't see because he was off screen. Towards the later levels, just how bad the camera really is starts to show off in frustrating ways. It took me more than 10 tries to beat a boss because half the time, I couldn't see where he was. When going up against the tougher variations, every action is crucial because one wrong move or a failed block could potentially result in a swift death. Having to deal with a uncooperative camera doesn't make this ninja's revenge any easier. I very much wanted Yaiba to be hands down amazing and from the trailers, it looked like Yaiba would be. While I didn't find Yaiba to be broken like some claimed it was, I do recognize the major issues that hinder the spin-off from being truly great. Surprisingly, there were plenty of laughs and crude humor throughout Yaiba and while I found it all very amusing, I couldn't look past negative aspects of the title. I can't even recommend Yaiba to Ninja Gaiden fans or even those of the Suda 51 titles. Instead, words of caution are better served here. Yaiba: Ninja Gaiden Z can be your best friend one day and a wicked enemy the next. Between the camera and high difficulty towards the later levels, it's not uncommon for people to rage quit. I myself, came very close to doing just that. My advice? Rent Yaiba: Ninja Gaiden Z because $60 is too much for this purchase in my opinion and one playthrough is all you really need.